Believe it or not, the Ukraine is one of the few places on earth where you’ll struggle to find an SR400, CB750, or even a XS650. Due to the Soviet regime before 1991, these older Japanese bikes simply weren’t imported into the country. 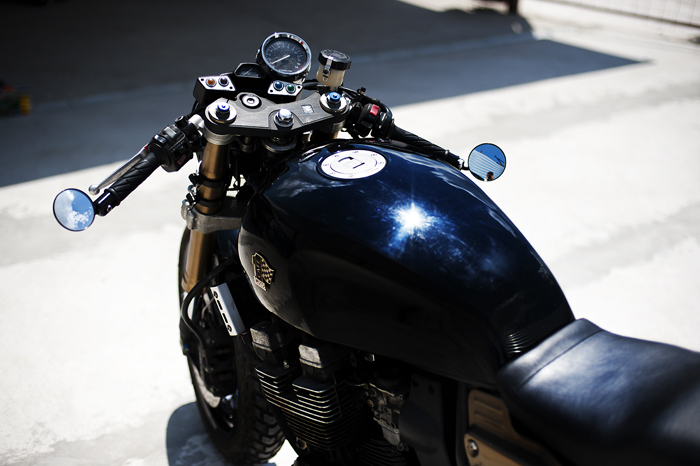 So when the 19 year old editor of MotoCafe.ru, Artem Terekhov was approached by motorcycle clothing brand Fast & Fashion to build a cafe racer in collaboration with them, he decided on a Yamaha XJR 400. It’s probably also worth mentioning that Artem comes from the Autonomous Republic of Crimea in the Ukraine, where cafe racers are few and far between. 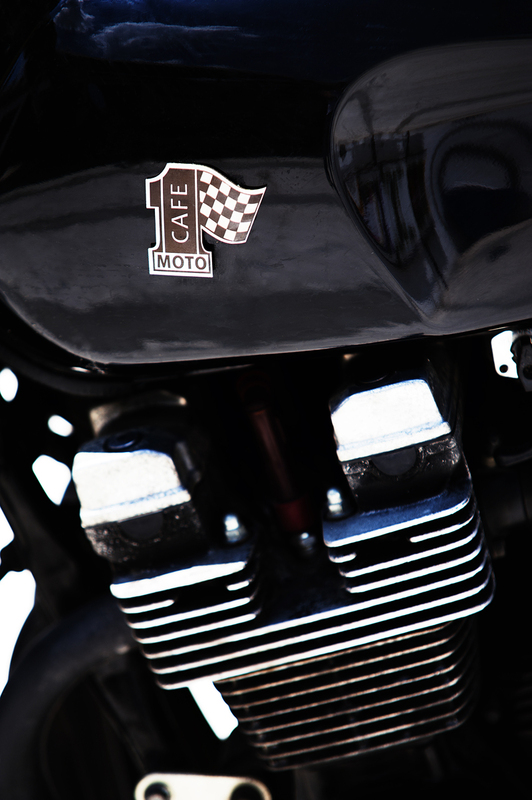 “Café racers are entirely absent here, so this bike turns heads every time we take it out for a ride” he says. Artem and his Dad started the project way back in July 2010 and the bike was only finished in March 2011. 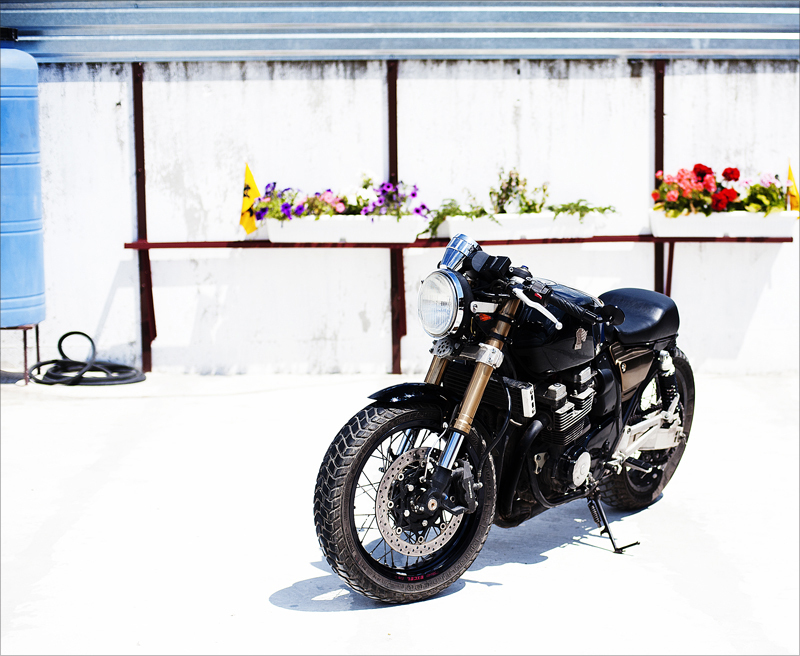 This is the build story of the bike they call ‘Fast & Fashion’ as told by Artem. “The donor bike is a stock 1993 Yamaha XJR 400. It is fitted with Suzuki GSX-R 600 K6 USD-forks (with gixxer yokes and clip-ons but with the xjr’s steering axis to match the headstock). Gixxer forks are shorter than stock the xjr’s by about 7.5 cm, so the bike’s front-end is lowered and overall silhouette gained a more dynamic and streamlined look. The stock heavy alloy wheels were replaced with spoked wheels from Yamaha XT660X 2004 – Excel Takasago aluminum alloy rims, shipped from Greece to Crimea by my friend and partner Evgeny Kobzev (AKA Joice) from MotoCafe.ru, who is also deeply involved in this project. Without his enthusiasm and help this bike can never see the light of day – even considering the fact that Joice lives in Greece and I’m in Crimea! Front wheel was fitted with gixxer’s 310-mm brake rotor (with help of in-house made adapter – the adapter was fitted on the hub to make the rotor fit perfectly into gixxer’s 4-pot radial tokico caliper). Overall, the front unsprung weight was reduced and new brakes are much better than XJR ever had. At the rear-end there was a lot of work too. I’ve fitted spoked wheel and installed two-pot brake caliper that were originally on the xjr’s front wheel (through the in-house made adapter). Stock rear shocks were replaced with YSS items. The subframe was modified – shortened and re-welded. After that we’ve fitted the new seat, made completely from scratch. The passenger seat is tiny, but just enough for a nice girl. The engine remained pretty much the same, except for refreshing all the necessary components (spark plugs, filters, servicing etc.). The exhaust system is aftermarket, although I don’t know who made it – it was installed on the bike when I’ve bought it. The sound is awesome – pure, juicy and loud, way better than stock whisperer. 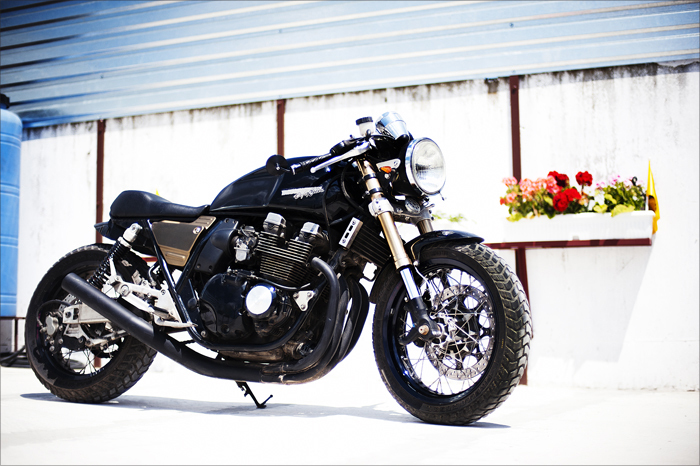 Artem tells us this XJR400 cafe racer is currently for sale. “I want to move to the next project” he says. So if you’re interested in the bike, it could be yours for the special price of $9000 USD o.n.o. Bear in mind that many bike parts are hard to get in Ukraine, so a lot of them would have been shipped in from all around Europe and USA. Any locals out there interested? 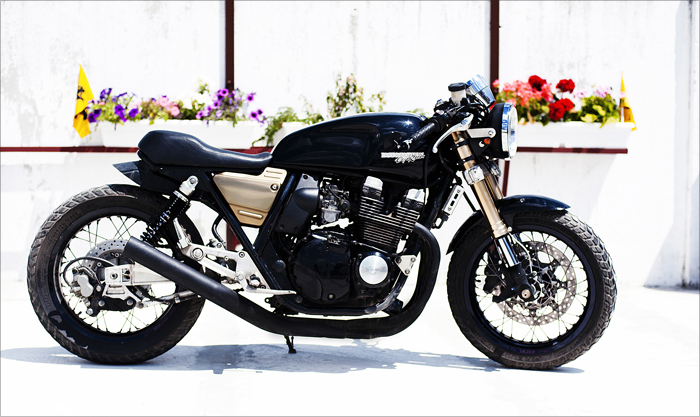 Looking at the end result, we are glad the Ukraine doesn’t get the more common Japanese bikes we see so much of. 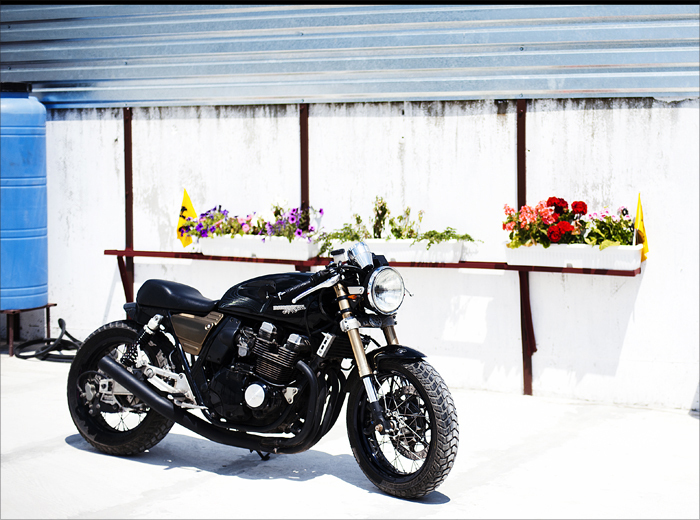 As with other Eastern European shops and some of the bikes coming out of India, it’s quite inspirational for us spoilt Westerners to see what can be done when you don’t have a lot at your fingertips. And all this from a 19 year old. Not bad, don’t you think?